And late Thursday, the Litecoin Foundation and Beam Corporation announced a possible collaboration that would use Beam’s Mimblewimble – a crypto protocol named after a Harry Potter spell – to improve its security. Litecoin was up 30% following the announcement, trading near $43 a coin. Still, those events are unlikely to be the catalyst for Friday’s midday surge as both stories crossed the tape well ahead of the sudden gains. Investors in the digital-currency space saw prices explode higher in 2017 as cryptomania swept over the world. 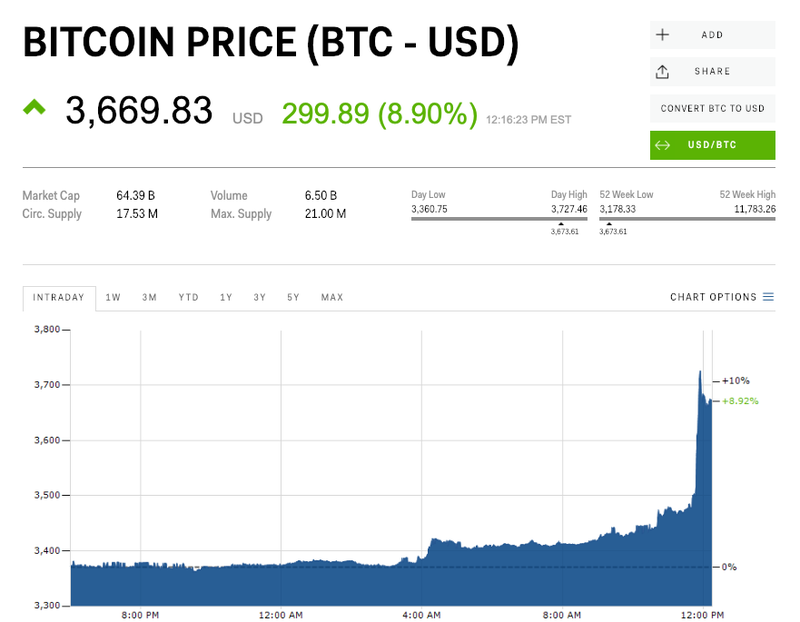 Bitcoin began 2017 worth less than $1,000 a coin before soaring more than 2,000% to a high of $19,511. However, the year of 2018 was a different story, with the cryptocurrency’s value plunging by 70%. Bitcoin is little changed for the year following Friday’s spike.